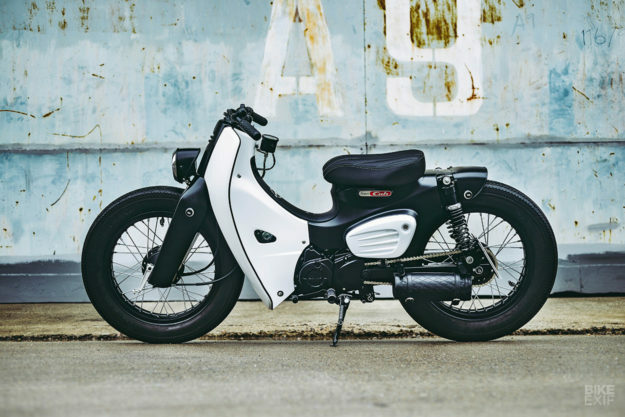 The Super Cub’s design has gradually modernized over the years, but the new 2018 model takes cues from the original, for a more retro look. 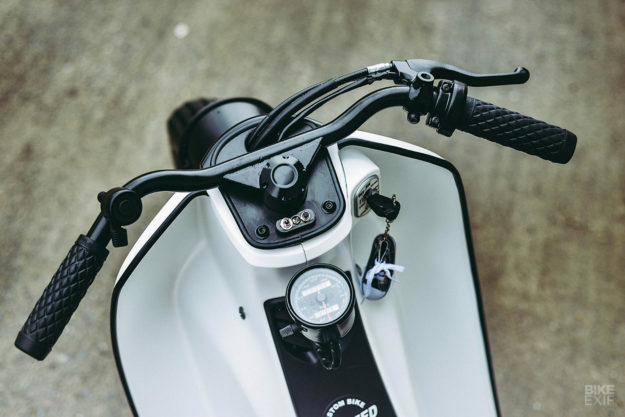 In stock form the 109cc, fuel-injected scoot mixes old school charm with modern tech, being equipped with drum brakes and LED lighting. 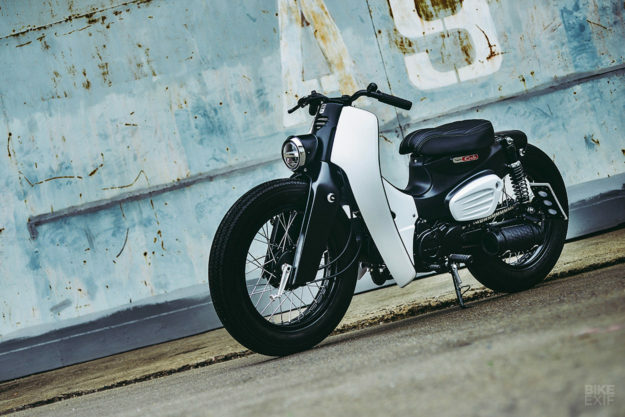 The 2018 Super Cub goes on sale in Thailand today—and into production in a Thai factory. 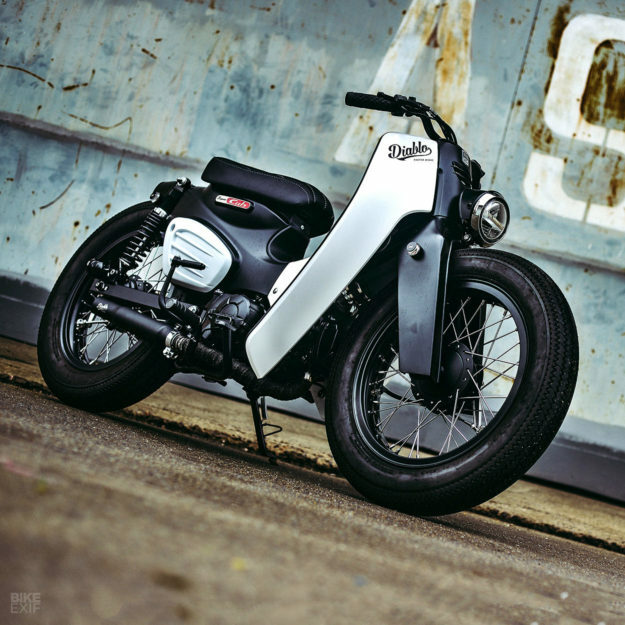 (Honda builds the Super Cub in numerous factories around the globe). 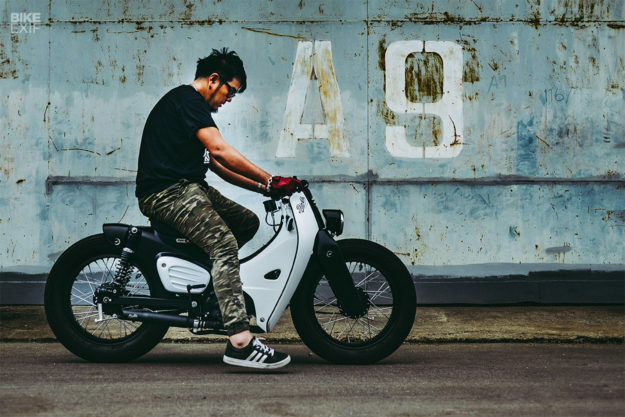 To mark the occasion, Honda Thailand handed the crew at K-Speed a new Super Cub last month, and gave them just 30 days to build something special. The new Super Cub looks so good out the box that we wouldn’t know what to do with it, but K-Speed have knocked this one out the park. It reminds us of a French Bulldog; it looks like it wants to brawl, but it’s actually quite cute. The biggest visual change is up front, where K-Speed tore apart the stock steering cluster. The OEM headlight now sits further down, housed in a custom-made nacelle. Up top are a new set of custom-made handlebars, adorned with a new throttle, Biltwell Inc. grips and a bell borrowed from the shop bicycle. Custom switches mounted below the steering stem control the starter and turn signals, with a simple analog speedo mounted just behind them. And all the wires that used to be housed inside the plastic cluster have been re-routed. 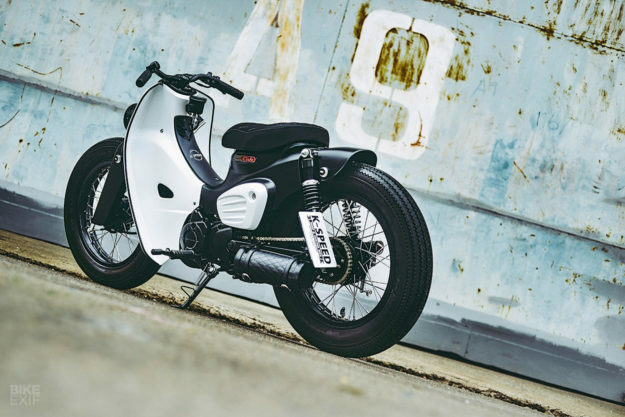 The Super Cub’s stance has been dramatically reworked too, thanks to a pair of 17×2.50 wheels wrapped in vintage-style Vee Rubber tires. K-Speed also fabricated metal fork covers, giving the whole front end a far beefier feel. K-Speed’s core business is actually aftermarket parts supply, so it’s not surprising that they have their own brand of custom accessories; Diablo. They raided the Diablo catalog for a new tail light and LED turn signals. 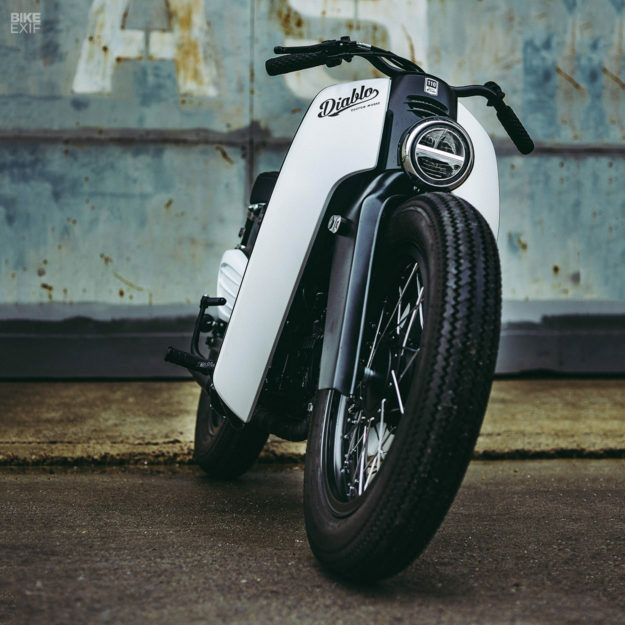 Other Diablo parts include the exhaust and ribbed side panels, though both were designed specifically for this bike. We’re hoping that means that K-Speed intends to put them into production for other Super Cub owners. 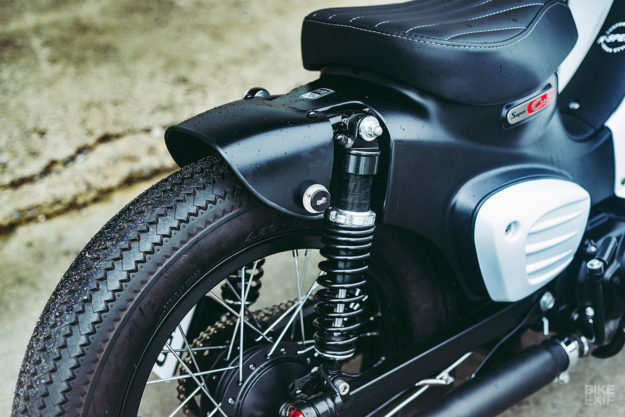 As we’ve come to expect from the Thai shop, there are a number of nifty little touches sprinkled throughout—including ‘hand grenade’ valve caps on the wheels and CNC-machined foot pegs. The black and white paint is on point too, with a blacked-out engine and wheels keeping things muted. 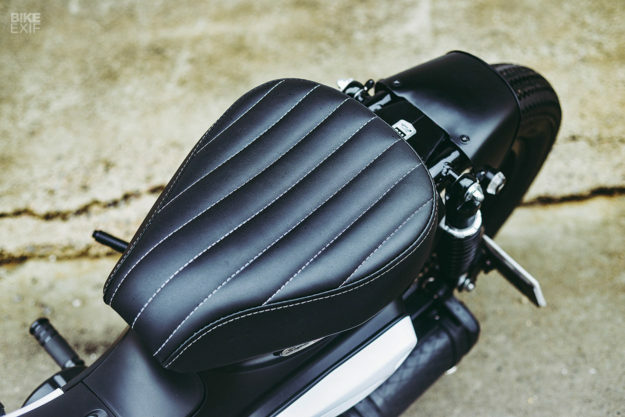 The seat’s been re-shaped, and re-upholstered with contrast stitching in a vertical tuck-and-roll pattern. For the final trim, K-Speed removed the scooter’s tiny front grille and Honda logo, but kept its side badges and added new decals to the front and back. 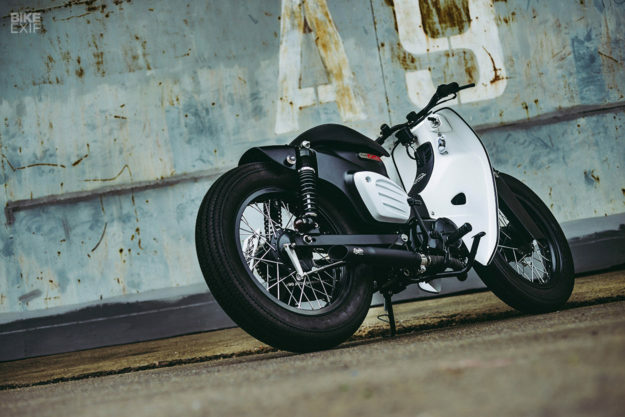 We love that the Super Cub is still going strong, and we’re downright smitten with K-Speed’s spin on it. 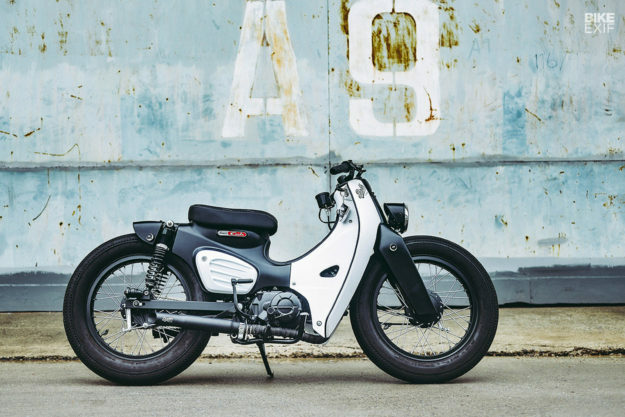 In a perfect world, Honda would produce a limited edition K-Speed Super Cub, and we’d buy one for those Saturday morning coffee runs.